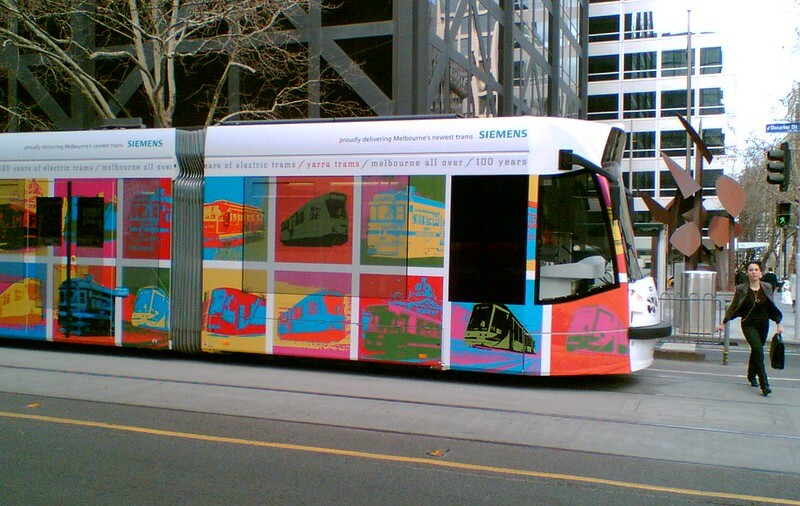 Siemens train paralleling an X’Trapolis train. Bourke Street at King Street, back when there were tram stops. 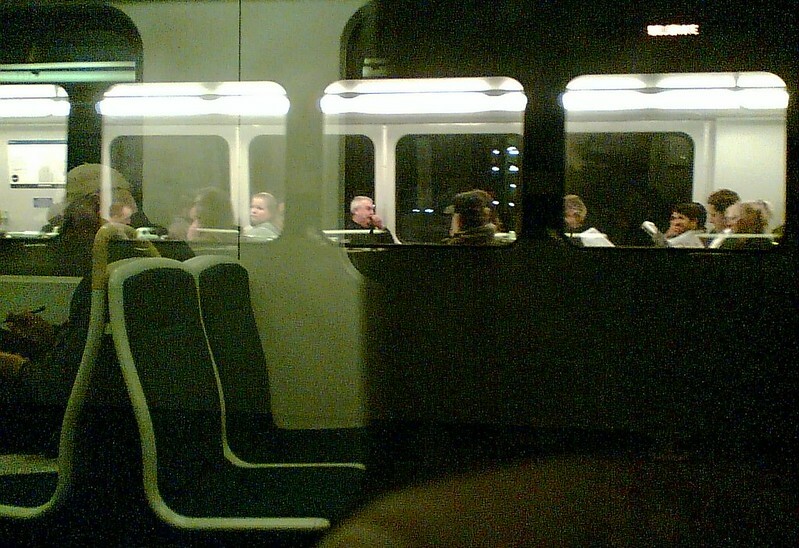 (Now the trams still usually stop there, due to the unfavourable traffic lights). 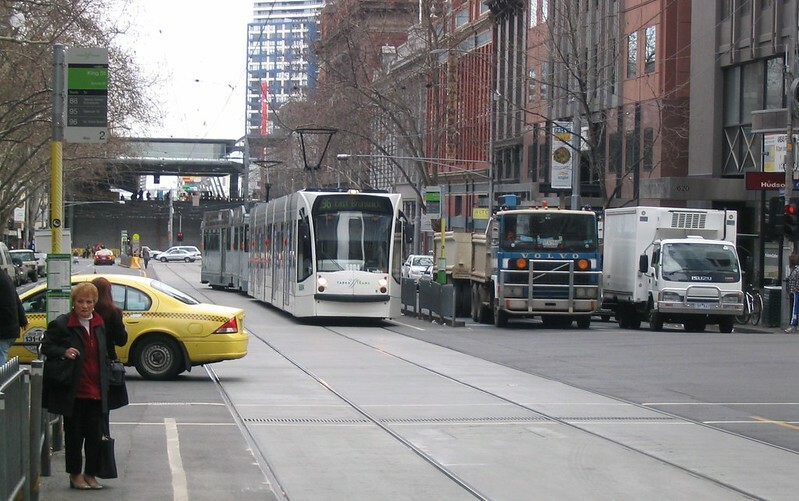 The distinctive Southern Cross Station steps can be seen in the background, as can the old tram stop, now replaced by the totally unsuitable platform stop. The second tram seems to be shunting, heading back east. 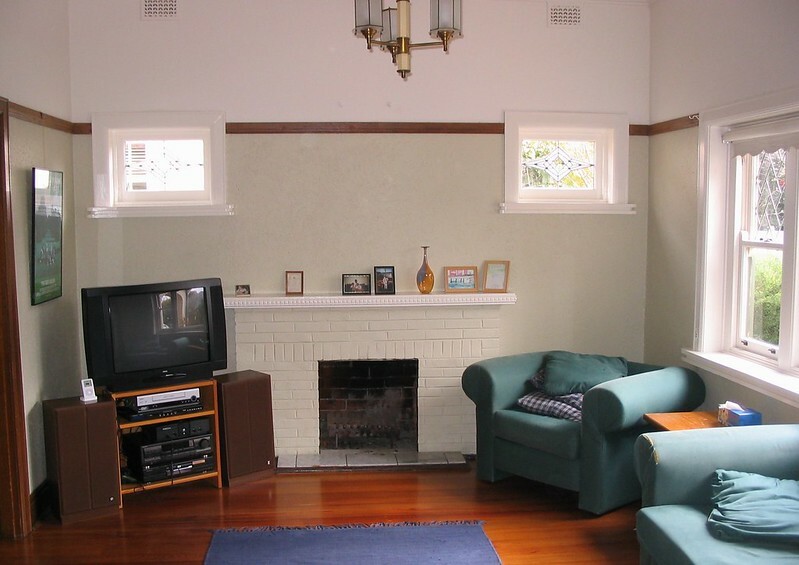 For my own interest mostly… my lounge room ten years ago. The TV has changed. The poster is gone (it fell off the wall one day). The horrible brown speakers, hi-fi receiver and DVD player are all gone and replaced. The VCR and the old XBox is gone (though we keep both in the cupboard as I still have tapes and old games that occasionally get played). The couch and chair have gone. The light fitting (the only repro one in the house) was replaced by a combined light and ceiling fan. The photos on the mantelpiece have multiplied. That old scrappy blue rug, which I’ve been intending to replace since I moved in, is still there. And nearby, the computer desks. 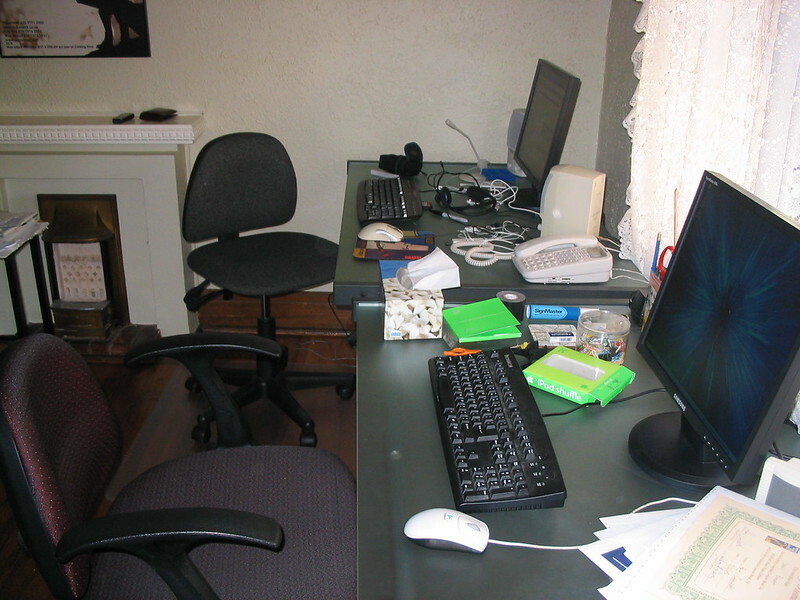 All the computery bits have since been replaced, and the chairs as well. Alas, the clutter, if anything, has increased. 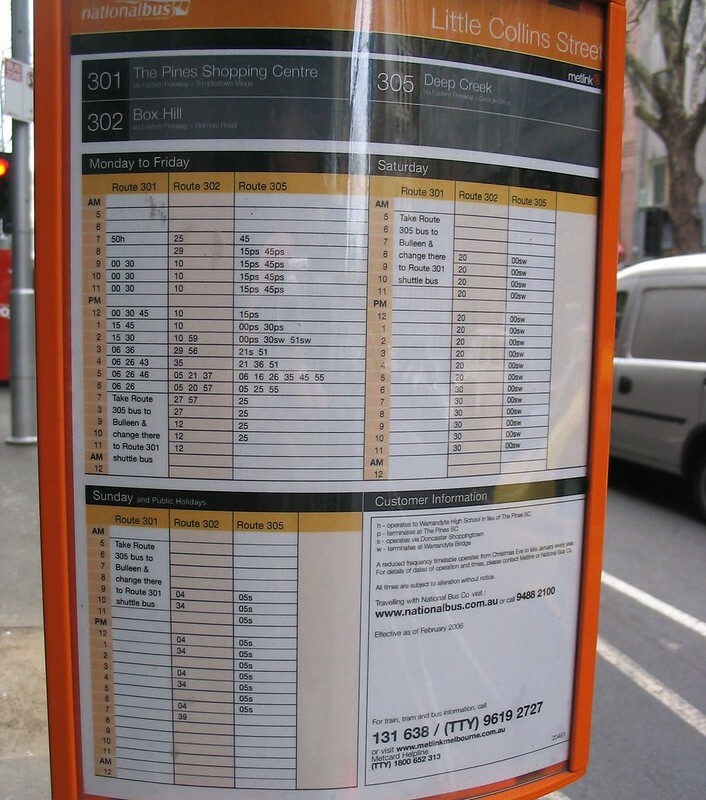 Queen Street bus stop timetable. In 2010 route 301 was replaced by “Doncaster Area Rapid Transit” Smartbus routes, which improved service frequency, especially outside peak times — the 302 and 305 still exist, though have also had extra services added, particularly on Saturdays. 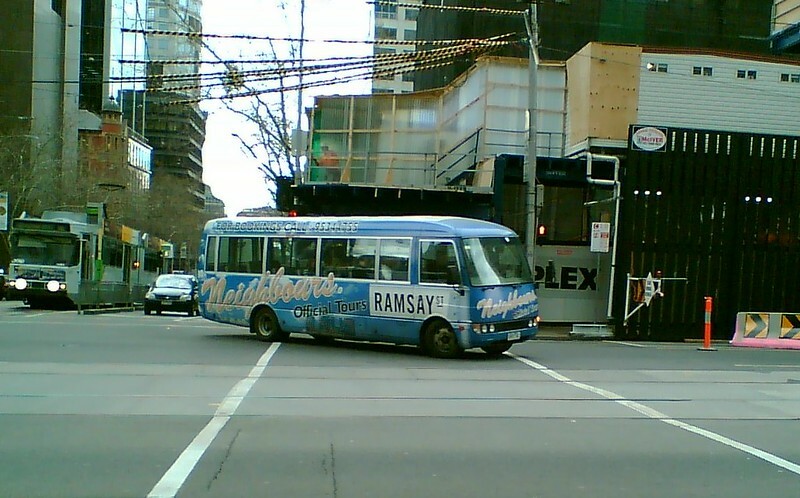 The official Neighbours Ramsay Street tour bus, catering for visiting fans of the TV show. Looks like this is still in operation. Interesting to see flat screen monitors in 2006 at your place. I’m sure I still had one at work until about 5 years ago. @Roger, do you mean you still had a CRT until 5 years ago? I’d hope you’ve switched to flat screen by now! Judging from this blog post, we got the flat screens earlier in 2006. From memory they’d become affordable, and of course they save space. Non-widescreen (4:3), 19 inch Samsungs. One eventually stopped working, but both were replaced with widescreen models (and one is sitting around somewhere as a spare). I wonder what was your first digital camera and when you got another camera after that. Would be interesting to do a little article containing a timeline of your camera purchases. I bought a DSLR (Nikon D50) around the start of 2006 also. Cost around $1500 and I had to go on the payment plan from Harvey Norman. Funnily enough they weren’t too keen on selling me one from the store in the city but the store at Fountain Gate was happy to. The 2 year extended warranty came in handy when I had to replace it with the D80. You can get a tram almost all the way to Pin Oak Court and then walk, it is a long way though. I still have a tube TV. Can not use it as my Hi Fi Amplifier needs to be fixed. But it still works. Two other TVs have since been updated. It is nice to see what has changed over a 10 year period of time.